From a Consultant's Notepad.......: "Predictive Modelling" ....I Say! “Tell me something you know about transformers….how do they operate and their application”!- He asked. “Is that a question?” – I smiled. “That’s why you are here; to answer my questions and not to throw them back!”- He was taken aback at my reply. “I am here to grab your chair”- I replied spontaneously! He seemed to be slightly impressed, though he tried his BEST to keep his composure. He had the raring trigger in hand, some fresh and shining bullets to drive the interrogation forward. “Well, I presume you didn't study this for your semester exams…are you trying to portray your dexterity?” – He had slowly moved back into the chair; on the face of it, he was enjoying the entire series of cross interaction. “What was grade point in the Final semester?”- inquired the cross-legged creature. “Do you know that the CV lying exactly beneath yours has a perfect numerical swap? Why should we undertake a 'down-ward' step at all?” – The creature had already shown signs of thrusting his protruding claws into my confidence. “May I know why did you people short-list me for this interview then?”- I honestly didn't know what to say. I was actually being humiliated to the core !!! “Because you scored well in the aptitude test and the group discussion rounds prior to this interview…we wanted to know the underlying reason for such an exponentially degrading grade curve!”- The monster in him had completely unleashed itself by then…. “Because I hated the University exam system….it lacked logic and sense”- I was compelled to vomit out the truth. “Oh! Mr. Rebel, I see….I have never encountered a candidate in my life uttering these words – ‘I love writing exams’ …but that’s how we judge entities; when we need a ‘basis’, we select the widely acclaimed one…”- The demon sounded conditionally logical for the first time…. “I wish I had known before-hand.....that such questions might come up…Sigh” – I completely bypassed his statement. “So tell me, Mr Electrical Engineer….did you learn the technique of fault-detection? Kolkata’s quite prone to power-cuts isn’t it?”- The brute persisted with the testing saga….he could have thrown me out of the room already. He didn't. “I know that the entire "semester-system" is ‘faulty’….a two-month industrial training exposure, that too after you have already passed the seventh semester? …Of course after we answered those questions without any sort of idea of what a transformer actually looks like…hilarious” – I had already extracted some “space” out of a displeasing conversation. “All that I can say is…this ‘EDUCATION system’ is responsible for today’s ignominy…had I found interest in an interactive curriculum or had I known those dumb questions before-hand…you would have given me a clean-chit within seconds”- I was literally fuming. “So you’re claiming that in future, all our client interactions would be predictive? You’d formulate an ingenuous hypothesis through which we can track before-hand, the possible show-stoppers involved in a client based deliverable?”- I REALLY couldn't gulp his instinctive excitement as he uttered those technical terms. 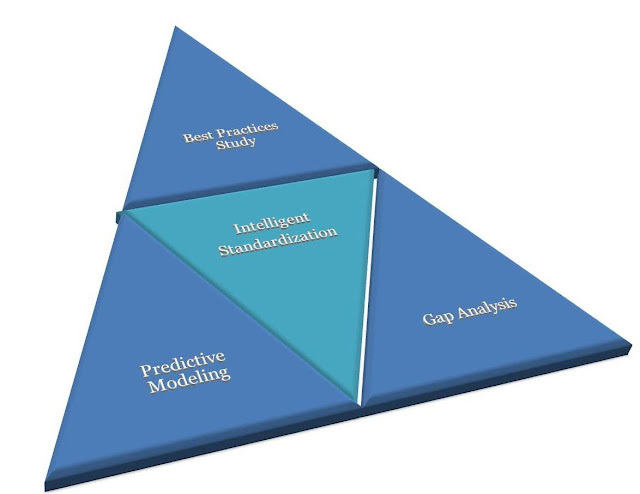 “Certainly…if not a hypothesis, we can certainly harvest on the BEST practices study or perhaps formulate a predictive modeling based on initial learning’s from previous client interactions….WAIT! Am I sounding too unrealistic ?”- Perhaps I was. He had a blank expression. “You can leave…..”- He responded calmly. “But…..”- Aghast. Perhaps I should have restrained the flow. “We are working on a predictive PPP modeling with the Synco Bank’s business process re-engineering model…would you like to contribute?”- He smirked. Coming back to the “point”, I would perhaps not re-iterate on what the vibrant Angad Nadkarni implied through the concept of “Examify”…but I would certainly say that his directional approach perhaps has far-sighted intentions. While mathematicians talk of Statistical hypothesis based on Chi-Square analysis or regression, this is perhaps the “way-ahead”! The interview that comes under the purview of a “test” of ability would harvest the right results in two-way aspect; it would help a candidate prepare himself better for the up-coming "atrocities" and the examiner to develop a clear-cut idea of what to expect and what not to, out of those submitted answers. Perhaps that would usher an era of scientific standardization in the field of education and add a definite basis of judgement! In short, if grades make a mark…perhaps more of these applications would come up in the near-future. Whether “this” would cater to the “app”-titude or address to the plaguing “app”-rehension, only time will speak! That's my envisaged "exam" oriented standardization frame-work....that's my interpretation of the concept of "Examify"ing...! This write-up is essentially a take-away from the concept demonstrated by a vibrant young gentleman on a National platform....glad that Franklin Templeton Investments partnered the TEDxGateway Mumbai in December 2012.